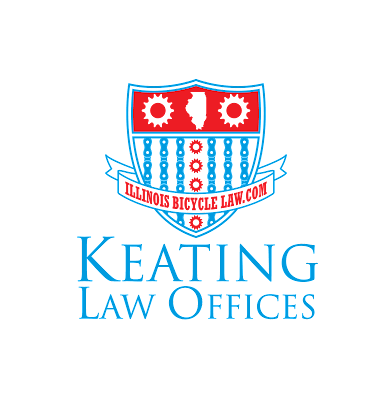 The Illinois Bicycle Lawyers at Keating Law Offices are proud of their long history of results representing victims of bicycle accidents throughout Illinois. It is a result of this history of obtaining justice on behalf of our clients that has allowed the firm to emerge as a national leader in representing victims of bicycle accidents in Illinois. The firm is committed to assisting any Illinois bicyclist who is injured in an accident and requires legal assistance. Below is a listing of some of the notable results obtained on behalf of our clients. $4,250,000.00 for the settlement of a wrongful death case stemming from the death of a pedestrian in Chicago who was killed while walking home from lunch with her fiancee. The decedent was survived by two minor sons. $1,250,000.00 for the family of a west suburban bicyclist who was killed in a collision with a motor vehicle while on a training ride. The settlement was obtained as the result of successful litigation of a wrongful death lawsuit. The settlement was for the $250,000.00 automobile insurance policy as well as the $1,000,000.00 umbrella insurance policy. Confidential Settlement for a bicyclist who was injured as a result of a crash with a motor vehicle. The matter was settled for nearly one million dollars by the insurance company prior to trial. $600,000.00 for a Downers Grove commuter who was struck in a crosswalk by a commercial vehicle. The settlement represented the full amount of the two insurance policies held by the company that owned the vehicle. $550,000.00 for a Chicago bicyclist who suffered a fractured tibial plateau that required surgery after being hit by a school bus in Harvey, Illinois. This settlement was one of the largest in Illinois history for personal injuries from a bicycle collision that did not involve paralysis or death. $500,000.00 for the family of a McHenry County bicyclist who died as a result of injuries sustained in a motor vehicle versus bicycle collision in a rural intersection. $375,000.00 for a Skokie bicyclist who suffered a fractured ankle that required surgery after being struck by a car near his home on Dempster in Skokie. The bicyclist was out on a bike ride as a part of a weight loss plan. It was alleged the driver failed to stop at the stop sign before hitting the bicyclist in the crosswalk. $350,000.00 for a Chicago bicyclist who suffered fractures in her arm that required surgery after hitting a pothole adjacent to a railroad track near Chicago's Goose Island. The case was previously rejected by another attorney who told the bicyclist she "had no case." $301,500.00 for a suburban bicyclist who was injured while commuting into the Loop on Green Bay Road. Prior to being forced to settle the case, the insurance company for the driver originally claimed that their driver had the right-of-way when the motorist pulled across traffic. $295,000.00 for a Chicago bicyclist who was the victim of a "right hook" when a taxicab hit him while he was riding in the Kinzie bike lane in River North. 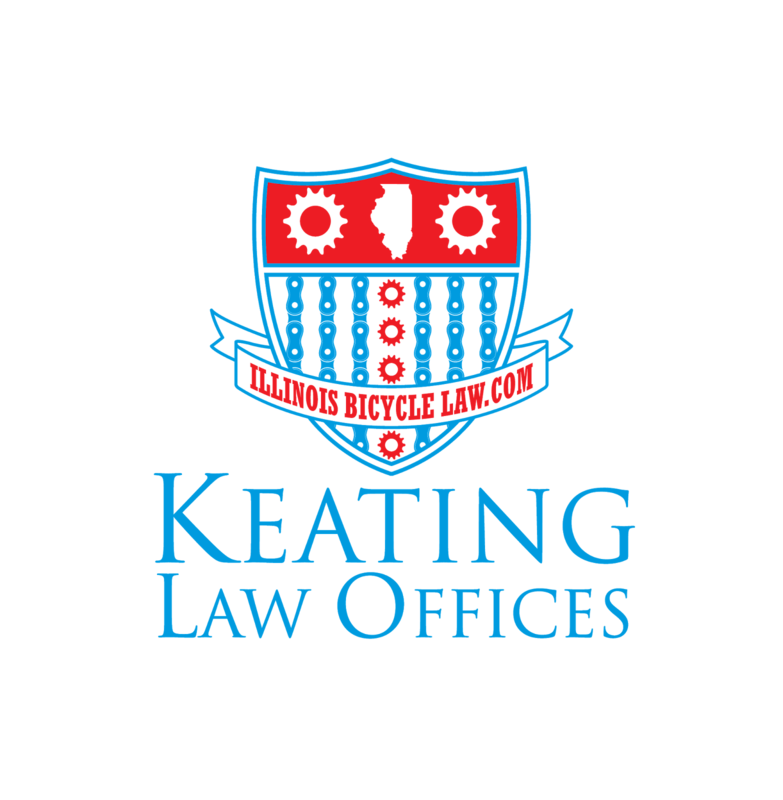 Keating Law Offices obtained footage from a City of Chicago red light camera that showed the taxi cab striking the bicyclist. $295,000.00 for a Chicago bicyclist who was injured when the bicyclist inadvertently crashed after running into a construction area where there were no signs or warnings of the new construction. During the lawsuit it was discovered that there were workers who were contractually responsible for placing signs and other warnings at the construction site. $275,000.00 as compensation to a Chicago bicyclist who was doored and suffered a concussion while bicycling in Chicago's Lakeview neighborhood. The settlement was in excess of the driver's insurance company's policy limits after another insurance policy was discovered in the case. $250,000.00 for a bicyclist living in Jefferson Park who was struck in a hit-and-run collision in Chicago's Jefferson Park Neighborhood. The bicyclist was a Massachusetts resident who was living in Chicago for college. Claim was paid by the client's parents' Uninsured Motorist insurance policy. Settlement represented the full limits of the insurance policy. $250,000.00 for a Chicago bicyclist who was severely injured after being doored by a motorist on Chicago's North Side. The bicyclist was then struck by another passing vehicle that fled the scene. Settlement represented the full limits of the insurance policy of the at-fault driver who opened her door into traffic. $250,000.00 for the family of a DeKalb girl who was struck by a car while riding her bike to school. This claim was settled by both the insurance company for the driver of the car and the Underinsured Motorist insurance policy of the girl's parents. The firm also assisted in placing the settlement proceeds into a structured settlement annuity that will pay the girl the settlement proceeds plus interest once she turns 18. Settlement represented the full limits of both insurance policies. $250,000.00 for the family of a Skokie bicyclist injured in a crash whose injuries led to his death weeks later. The amount represented the full amount of the applicable insurance limits. $250,000.00 for a college student from Ohio who was doored in Chicago and suffered a broken arm. The settlement represented the total amounts of both the insurance policy for the driver who doored the bicyclist and the underinsured motorist claim through her own insurance. $250,000.00 for a Chicago bicyclist who was struck by a turning pick-up truck at the intersection of Milwaukee and Chicago in Chicago's River West Neighborhood. The settlement represented the full amount of insurance coverage for the bicyclist who suffered a fractured leg. $200,000.00 for a Warrenville bicyclist who suffered a fractured leg after being struck by a motor vehicle crossing the Illinois Prairie Path in DuPage County. $200,000.00 for a Chicago bicyclist who suffered a broken wrist that required surgery after another bicyclists negligently crashed into him. The insurance company for the at-fault bicyclist denied the insurance claim but then settled right after Keating Law Offices filed a lawsuit on behalf of the injured cyclist. $190,000.00 for a Chicago bicyclist who was injured when a car failed to stop at a stop sign and hit the bicyclist while riding on Montrose. The crash caused a fractured upper arm that required surgery. $175,000.00 for a Chicago bicyclist who suffered a fractured leg when he was doored while commuting home from work in a marked bike lane. The at-fault driver denied responsibility but was found guilty in traffic court and the insurance company ultimately was forced to settle the case. $160,000.00 for a bicyclist doored on Halsted Street in the West Loop by a passenger exiting a vehicle. Settlement was paid by the insurance company that insured the owner of the vehicle. $160,000.00 for two bicyclists who were struck from the rear on a training ride by a motorist in Chicago's northwest suburbs. $130,000.00 to settle a Dram Shop Act claim against a restaurant that served alcohol to a motorist who then caused a bicycle crash after leaving the restaurant. $127,000.00 for a Chicago bicyclist who was doored by one driver and then suffered a fractured foot after being struck by a second driver. The settlement was in excess of the at-fault driver's insurance limits and included a contribution by the second driver. $125,000.00 for a Chicago bicyclist who suffered a fractured collarbone and other injuries when she was cut off by a jogger on Chicago's Lakefront Path. $125,000.00 for a semi-professional mountain biker who was injured when a component on her bicycle failed and she crashed when landing a jump and suffered a fractured wrist. $105,000.00 for a bicyclist who was struck by a motorist exiting a parking lot and then dragged 25-30 underneath the vehicle before the driver stopped. $100,000.00 for a south suburban bicyclist who was struck by a driver that ran a red light. $100,000.00 for a Riverside bicycle commuter who was struck by a vehicle while riding home from her workplace. The settlement represented the full amounts of the policy limits for the insurance policy covering the driver of the vehicle. $100,000.00 for a Bolingbrook man who was struck by a turning car in the crosswalk and then dragged 40 feet before the motorist stopped. The settlement represented the full amounts of the policy limits for the insurance policy covering the driver of the vehicle. $100,000.00 for a Chicago man who was a victim of a hit-and-run bicycle crash on Chicago's North Side. Settlement was for the full policy limits of the bicyclist's own Uninsured Motorist Coverage insurance policy. $100,000.00 for a Chicago woman from the Little Village neighborhood who was struck by a truck while bicycling to her work in the South Loop. $100,000.00 for a Rockford bicyclist struck by a driver who did not yield the right-of-way. The settlement was for the full amount of the applicable insurance policy. $100,000.00 for a North Suburban Chicago bicyclist who was injured when a motorist failed to provide 3-Feet when passing pursuant to the "3-Foot Rule." The settlement represented the full amount of the policy limits for the offending motorist. $100,000.00 for a Chicago bicyclist who sustained a fractured arm that required surgery after she was struck by a motorist in Lakeview. The case was settled for the full policy limits after State Farm Insurance initially denied the claim and a lawsuit was filed on behalf of the bicyclist. $100,000.00 for a Hoffman Estates bicyclist who suffered a knee injury after she was struck by a motorist near Busse Woods. $100,000.00 for a bicyclist struck by a motor vehicle fleeing the police in Peoria. The bicyclist was a college student on a training ride who was severely injured. The settlement represented the full amount available under his family's uninsured motorist coverage in their insurance policy. $100,000.00 for a Chicago bicyclist injured when a Chicago police car made a left turn in front of the bicyclist while he was riding down Clark Street near Wrigley Field. $100,000.00 for a bicyclist injured while competing in the Chicago Triathalon when a motorist crossed into the marked lane for triathletes riding the bicycle portion of the triathalon. The driver was uninsured and later pled guilty to charges related to the crash. The settlement represented the full amount of the triathlete's uninsured motorist coverage. $100,000.00 for an Oak Park bicyclist who suffered a fractured arm as a result of a hit-and-run on Chicago West Side. The settlement was for the policy limits of the bicyclist's uninsured motorist insurance policy. $100,000.00 for a Chicago bicyclist who suffered a fractured hand while commuting home in Chicago's Loop near Union Station. The settlement represented the full amount of the at-fault motorist's insurance policy with State Farm. $85,500.00 for a Chicago bicyclist who was injured when an oncoming driver performed a "left hook" in front of the oncoming cyclist. $85,000.00 for a Chicago bicyclist who suffered a fractured collarbone when a taxicab pulled from a parked position directly into the bicyclist riding in the Halsted Street bike lane. $80,000.00 for a Chicago bicyclist who was doored on Chicago's Near West Side and sustained serious injuries. $75,000.00 for a Chicago bicyclist who was hit by a delivery truck that failed to stay in its lane. The bicyclist suffered a simple fracture of his wrist and a cut on his head. He did not seek any medical treatment other than an emergency room visit and some basic follow-up care. The result was one of the largest of its kind for a wrist fracture without extensive medical care nor a surgery. $75,000.00 awarded in an arbitration with the Hon. Joseph Casciato (Ret.) for a Evanston bicyclist who was injured in a left hook as he was commuting home in the bicycle lane on Clybourn. The result obtained at arbitration was three times the amount offered by Allstate Insurance to settle the case. $67,500.00 for a West Suburban bicyclist injured when right-hooked by an SUV near the Illinois Prairie Path in Wheaton, Illinois. $65,000.00 for a Chicago bicyclist who was doored in Lincoln Park and suffered a foot injury that required extensive physical therapy. $60,000.00 for a Chicago bicyclist who suffered a simple collarbone fracture that healed without surgery and with minimal physical therapy. $60,0000.00 for a Chicago woman who suffered a knee injury when a taxicab did not come to a complete stop at a stoplight on Michigan Avenue near the Magnificent Mile. $54,000.00 for a Chicago bicyclist who was injured in Old Town when a motorist merged into him. The insurance company denied the claim and a lawsuit was filed. The case was settled as a jury trial approached and the insurance company was forced to settle the case. $53,000.00 for a Chicago bicyclist even after the insurance company for the at-fault driver claimed she was not injured. $52,000.00 for a Naperville bicyclist injured when two cars collided and one of the cars caromed into him while stopped on his bike at a red light. $50,000.00 for a Chicago man who was rear ended by an S.U.V. while riding in Chicago's Gold Coast. $50,000.00 for the family of a Chicago bicyclist killed in bicycle crash where the police department claimed the bicyclist was at fault. The settlement represented the full amount of insurance available for the accident. $50,000.00 for the family of 15-year old high school student who was the victim of a hit-and-run bicycle crash. The vehicle involved in the crash was later located by the police. The settlement represented the full amounts of the policy limits for the insurance policy covering the vehicle. $50,000.00 for a Chicago man who was struck in the bike lane on Halsted Street by a driver that ran the red light on Division Street. $50,000.00 for a Chicago woman who was tailgated and then rear ended and dragged by a driver who caused her to suffer severe road rash over most of her body. Settlement represented the full limits of the insurance policy. $50,000.00 for a Glen Ellyn man who was the victim of a "left hook" in west suburban Glendale Heights while commuting home from work via bicycle. $50,000.00 for a Chicago woman who a victim of a "left hook" in Logan Square and suffered multiple soft tissue injuries and a fractured tailbone that caused a decline in her overall health and caused prolonged suffering. Settlement represented the full limits of the insurance policy. $50,000.00 for a Chicago woman who was injured on her bicycle when a motorist pulled out of a parking lot without yielding the right of way to the oncoming bicyclist in the Rogers Park neighborhood. Settlement represented the full limits of the insurance policy. $50,000.00 for a Lisle man who suffered a constellation of injuries when he was the victim of a "left hook" while bicycling in Downers Grove. $45,000.00 for a Chicago bicyclist who was sideswiped by a passing Chicago Transit Authority bus. $45,000.00 for a Chicago bicyclist who was injured when a motorist illegally entered an intersection in Old Town. $40,000.00 for a Quincy woman who was the victim of a "left hook" while on a recreational ride near her home and suffered a fracture of her leg that healed without surgery. $36,000.00 for an Illinois bicyclist who was injured in a bicycle accident with a motor vehicle while training for an Ironman race. $25,000.00 for a Chicago man who was doored and suffered a broken arm on Wells Street in the Old Town neighborhood while bicycling in the marked bike lane. $25,000.00 for a Chicago man who was the victim of a "left hook." $25,000.00 for a Logan Square bicyclist who was the victim of a "left hook" while riding his bicycle on Elston. $25,000.00 for a Chicago woman who was rear ended by a motorist while bicycling near the Magnificent Mile. $22,500.00 for a Chicago woman who was the victim of a "right hook" near an expressway on ramp. The motorist originally gave false identification but was nonetheless located as a result of the firm's investigation. $20,500.00 for a Chicago man who was "doored" by the driver of an SUV who was exiting the vehicle onto the bike lane on Damen Avenue. $20,000.00 for a Schaumburg man who was struck by a turning motorist while bicycling in Arlington Heights. $20,000.00 for a Michigan resident living in Chicago was suffered a fractured collarbone when hit by a car that did not come to a complete stop at a red light before turning. Settlement represented the full limits of the insurance policy. $20,000.00 for a Skokie resident who was hit while riding across the street in Skokie by a motorcyclist who was attempting to "beat" a yellow light. Settlement represented the full limits of the insurance policy for the motorcyclist. $20,000.00 for an Arlington Heights man who was riding his bicycle across a crosswalk when he was struck by a driver who failed to yield the right of way. $20,000.00 for a Chicago man who suffered a broken arm when he was rear ended by a motorist near his home in Logan Square. Settlement represented the full limits of the insurance policy. $20,000.00 for a Chicago woman who was hit by a motorist who failed to yield the right of way to the bicyclist when making a right turn and turned right into the bicyclist. Settlement represented the full limits of the insurance policy. $20,000.00 for a Chicago man from the Logan Square neighborhood who was hit by a motorist in the protected bike lane in River North. $20,000.00 for a Berwyn woman who was "doored" while bicycling home from her job as a cook at a Chicago restaurant. Settlement represented the full limits of the insurance policy. $20,000.00 for a Chicago man who was injured when a motorist ran a red light. The case involved the full amount of the injury insurance policy for the driver. $18,000.00 for a Chicago bike messenger who was struck by a vehicle that merged into him while en route for a delivery. $17,500.00 for the family of a Chicago girl who was hit by a motorist in the City's Little Village neighborhood. $17,500.00 for a Chicago bicyclist who sustained dental injuries in a bike crash. $16,000.00 for a West Suburban woman who is a world ranked Ironman and endurance athlete who was struck by a school bus while on a training ride and suffered sprains and road rash. $15,000.00 to resolve a lawsuit for a Chicago bicyclist who was the victim of a "left-hook" bicycle collision when a driver turned left immediately in front of the bicyclist as he legally rode down a bike lane. Settlement represented a 100% increase over the offer to settle the case before the lawsuit was filed. $15,000.00 for a Chicago man who was a victim of a "right-hook" bicycle collision on the City's North Side. $15,000.00 for a Chicago woman who was "doored" by a taxi cab driver while bicycling down the bike lane on Halsted Street. The Illinois Bicycle Lawyers at Keating Law Offices are proud to have have handled many cases on behalf of injured bicyclists that were resolved for less than these amounts. Regardless of the potential financial value of the case, the firm is committed to representing bicyclists who have been injured by the negligent actions of others. 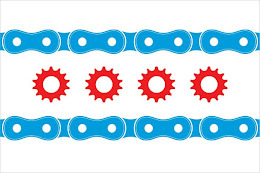 The firm is committed to representing "any bicyclist injured anywhere in Illinois at anytime." Please call Keating Law Offices at 312-239-6787 (Business Hours) or 312-208-7702 (Nights/Weekends) to discuss your case. You can also use our "Chat Live" function on this website to chat with an actual, live operator about your case. All initial consultations are absolutely free of charge and completely confidential. Call anytime, we are here to help.